Earn up to 2,600 reward points. This 2x12 combo offers up plenty of power for the stage, and awesome features for practice. 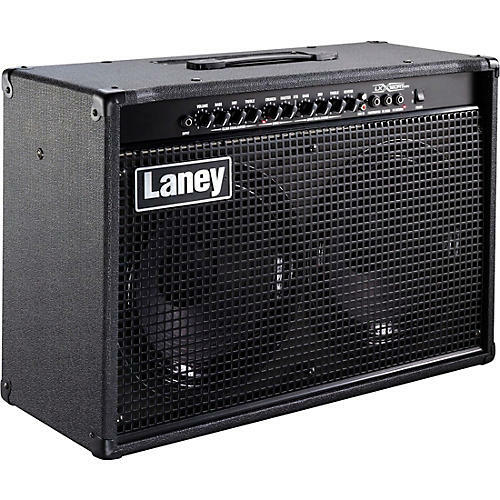 The Laney LX120RT is a twin channel, twin 12" speaker guitar combo kicking out 120 watts RMS with 2 channels each with 3-band EQ and on-board Reverb. The LX120RT is ready to hit the stage hard. With 120 watts of power, a broad spectrum of tones and twin 12” HH speakers, it delivers on stage or rehearsal time and time again. Clean and Drive channels both have their own independent 3 band EQ for more variation between sounds. The Drive channel also features switchable XTS tone shaping for an instant scoop to the mid and a boost to key frequencies. On-board reverb can also be dialed in to add ambience to the tone. The twin 12” loudspeakers have been custom-designed for Laney by HH giving the perfect loudspeaker pairing to get the best from the amplifier stage. For an expanded performance rig, the Extension Speaker socket can also be used to add another cabinet. An FX loop allows the connection of outboard effects. Reverb and Channel can be selected remotely with the connection of a footswitch (FS2).